I wrote this story about my first marathon, in Berlin in 1984 (back then, the city was still divided, and the race only went through West Berlin). Plagiarizing the idea from my own "The Roadrace" article, I wrote the story for Overseas!, a magazine for US troops stationed in Europe, so I tried to make it sound really gung-ho. Please forgive my stylistic adrenaline overdose. You'll also notice that I was much better prepared for this race than for my first road race, aiming at a 3-hour finishing time, although a knee injury during training almost put me out of the race. I went on to run the Berlin Marathon a few more times, including the first time it went through the re-unified city in 1990. The double-decker bus pulled over to a deserted Berlin street corner and the driver motioned that all of us in smelly track shoes and mis-matched warm-up suits had to get out. Out on the pavement, watching the empty bus rumble away, we quickly realized that we were stuck, God knows where, with no more buses, no subway entrance in sight and only 20 minutes left for the last check-in time for the marathon. There was only one thing left for a group of seasoned athletes to do -- go crazy. A few took off jogging down one street, a couple of others disappeared into a parking lot and three more hailed the first taxi that came along. 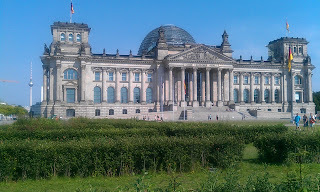 The four of us remaining started walking in what we thought was the general direction of the Reichstag building, watching for more cabs. "This is great," I said sarcastically, although everyone else was busy listening to their own private air-raid sirens. "Everything that could go wrong, has," I groaned as we tried to flag down an already-full taxi. It was then that the first raindrops came splattering down on our heads. 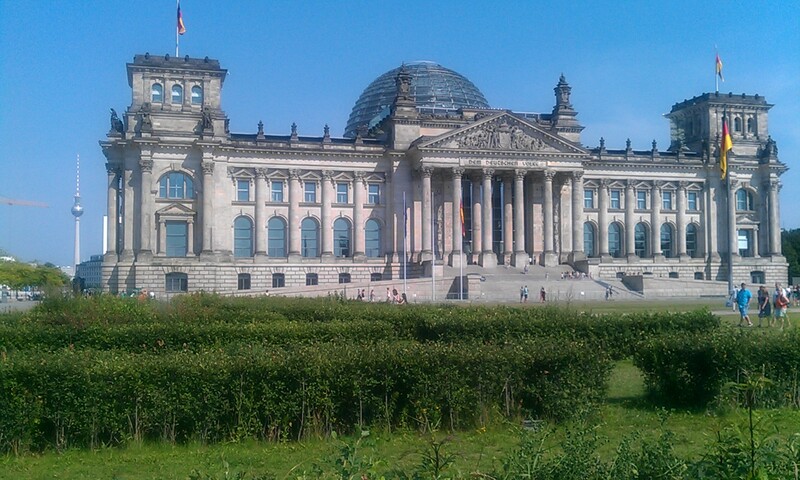 Luckily, taxis almost outnumber bars in Berlin and we got dumped off at the abandoned Reichstag just in time. I climbed the steps under the old imperial Prussian eagles and looked out over the vast lawn carpeted with runners -- almost 8,000 wet, smelly marathoners, the biggest group of athletes ever gathered together in German history. NOTE: in contrast, there were about 41,000 runners in the 2012 Berlin Marathon. Since it was my first marathon and I was unrated, I had to line up at the end of the impatient mob. While we were all milling around in the drizzle, the announcer read a list of all the far-flung, exotic lands that the participants had traveled from just to be there: Togo, Sierra Leone, Indonesia, the AAFES gas station in Frankfurt. It was impressive. Finally, the big time came -- just a few seconds before 9 a.m. "Drei, zwei, eins . . ." Everyone counted it out together. I braced my legs. The gun popped. Nothing happened. Everyone in the back was still standing around. "Hey, I think we're supposed to go or something," I said to the runners around me. But nobody moved. I looked at my watch. One minute had already passed. The next time I looked at my watch, two minutes had ticked by. "Yuh know, this marathoning isn't as exciting as I thought it'd be," I said to the guy to my right, who was yawning. The rain started coming down harder. The course had been laid out to go by a lot of the most interesting places in West Berlin: the Victory column, the Tiergarten park, the Kurfürstendamm (Ku'damm), along the Wall and past Checkpoint Charlie, through the Kreuzberg Turkish neighborhood, past the Schöneberger Rathaus where John Kennedy made his "I am a Berliner" speech and then out west to the green, tree-lined suburbs before finishing-up back in the heart of West Berlin, on the Ku'damm. That pouring rain instantly became my big worry as my shoes and socks began soaking up the water until it felt like I had laced-on a pair of sponge-diver's lead boots. That was the last thing I wanted -- running 42 kilometers with the equivalent of a Sears Die-Hard car-battery strapped to each foot. "This'll be great training for the first marathon on Jupiter," I thought as my shoe submerged into a giant puddle. Endless rain and 50 degrees (F., that's 10 degrees C.). After five kilometers I turned cold. I had no idea how fast to go. But soon I was passing people, a lot of people. I thought maybe I was setting too hard a pace, but it felt comfortable. And despite the kryptonite-laden shoes, I felt strong. I was shooting for a time of about three hours, or about seven minutes a mile. That was as fast a pace as I could run for two kilometers, much less for 42, but it seemed like a good goal to shoot for. We turned down the Ku'damm, Germany's liveliest street. In the two days before the race I'd learned to love this place -- filled with restaurants and shops open till well past midnight, and discos and bars that never close their doors. Double-decker buses and street musicians, elegant cafes and hard-driving rock clubs brushing elbows, and everything blending together. We turned off the Ku'damm and I still felt great. Every five kilometers I downed a glass of energy drink that they were handing out, and I hardly noticed that it was me who was doing the work of moving all the scenery. It was almost impossible not to feel excited: the bystanders lining the streets were so friendly, so wildly enthusiastic that there was electricity in the air. People stood in the rain for hours, cheering every runner who came by, waving signs, singing songs. People were having parties out on their balconies overhead, banging pots and spinning noisemakers. I'd never experienced anything like it. Berliners have long had a reputation among Germans as being the most fun-loving of their countrymen, but I'd figured that 40 years of living isolated in their walled-in enclave would have turned them into the most depressed people on earth. I was knocked out by the friendly reality: It was a three-hour love-in out in the streets. The biggest crowd-pleaser, though, was a guy who'd registered his dog, put a number on its back and the two ran side by side the whole way. When I reached the half-way point I was right on the money with a three-hour pace (about 4.2 min. per km, or 6.9 min. per mile), and I still felt like I'd just started. It was a bit sobering, though, realizing that the race leaders were on the last leg, about 13 kilometers ahead. We ran through the borough of Steglitz, and the rush from the cheering crowd was incredible. The course narrowed under a railroad trestle and the energy from the crowd was enough to set light bulbs popping. They cheered us like a liberating army. They seemed grateful that we would even visit them in their city that the Cold War forgot. I felt tears roll down my cheeks. At the 25-kilometer point I crossed a personal no-man's land into a distance I'd never run before in my life; and the leaders, somewhere across the city, were powering past the finish line. The 27-kilometer marker approached. So far, so good. But now I was starting to tire. I started to notice how long every step took. I searched ahead impatiently for the next kilometer marker. At 32 kilometers, it really slammed me. It was real work now. My pace fell off. I glanced into the massage tents on the left and I was shocked. It looked like a field-hospital full of walking wounded. Then, at 37 kilometers, with just five kilometers to go, my willpower just snapped. All the joy evaporated. The applause no longer helped. The whole thing took on the feeling of a death march. No energy, no emotion, just an exhausted forward plodding. My feet were moving more slowly. Runners started passing me by. At around 39 kilometers the muscles near my groin hurt so much that I could hardly lift my legs. My feet just scuffled across the pavement. At a large intersection, a group of people applauded and cheered me on. I couldn't even look them back in the eyes. I felt like a traitor: if they only knew that my only thought was to quit, they wouldn't be applauding, I thought. More and more runners were passing me. My eyes kept searching ahead for the Ku'damm, the finish line banner, anything that promised the end of the agony. But it just wouldn't appear. We ground out block after block, and every curve just led onto more endless rows of houses ahead on the wrong street name. An old man came huffing by, then a kid. Finally the Ku'damm sign and the familiar street scene. Somewhere down there was the "FINISH" banner and the end of this godawful punishment. I forced myself to go a little faster. Every step was agony. I groaned out loud. I saw it! This was it: "FINISH," a big crowd, a loudspeaker blaring out something from a stand overhead, the roped-off finish lanes, a clock ticking out 3:34:52. Just past the line, I groaned and bent over instinctively toward the ground. I wanted to die. I started to turn cold. I only had two things on my mind: finding my windbreaker and then a place to sit down. I was limping through the crowd of finishers, making my way to the long line of British Army trucks holding our gear. The whole runner's mob was reforming there. But this time wetter, colder, physically spent and wrapped in sheets of aluminum foil like walking leftovers. Lines of massage cots flanked the street, each cot with a dozen or so runners waiting for a chance to lie down. The winner, John Skovbjerg of Denmark, was long gone. He'd already come through an hour and 20 minutes earlier. And then another 4,050 had come in before me, putting me right in the middle. More kept streaming in every second. I heard my name. It was my wife holding my windbreaker. Like Florence Nightingale, she dragged me down into a subway and back to our bed-and-breakfast for a hot bath. Oh man, that was like going to heaven, but better because it wasn't so permanent. A Greek dinner and a couple of beers later, and I was almost like a normal human being again. I knocked back an ouzo and picked up a brochure I'd gotten at the finish. Something caught my eye. "Hey, there's a marathon in Munich in May. I've always wanted to see Munich . . ."